What does a wave of U.S. and Canadian strikes say about the future of labor? After failing to reach an agreement through mediation with Canada Post, the state-owned mail corporation, the Canadian Union of Postal Workers initiated a series of 24-hour strikes in October, rotating them around the country in an effort to mitigate the impact on mail recipients. The strikes were called during the busiest mailing season of the year, before Black Friday and continuing through Christmas. In its announcement of the strikes, the union said it was fighting for “job security, an end to forced overtime and overburdening, better health and safety measures, service expansion and equality for” mail carriers in rural and suburban areas, who are mostly women and make less than their urban counterparts—mostly men. Canada’s House of Commons and Senate passed expedited legislation last November to put a legal end to C.U.P.W.’s strikes. The union has a history of militancy. In 1978, Jean-Claude Parrot, then the leader of C.U.P.W., was jailed for defying back-to-work legislation. More recently, the Canadian Parliament legislated postal workers back to work in 2011, under Prime Minister Stephen Harper, a decision later judged unconstitutional by Canada’s Supreme Court. The postal workers’ strike comes on the heels of a long strike at York University in Toronto, which lasted 143 days in 2018 before contract professors, teaching assistants, part-time librarians and archivists, and graduate assistants were legislated back to work by the freshly elected Progressive Conservative Party’s Ontario government in June. Less than a year earlier, Ontario college teachers were legislated back to work by the provincial government, then run by the Liberal Party. “C.U.P.W. is the poster child for the dynamic of Canadian labor,” says Barry Eidlin, assistant professor of sociology at McGill University and the author of Labor and the Class Idea in the United States and Canada, which looks at the histories of unions in both countries. “The state’s heavy-handed response is also very characteristic of the Canadian dynamic,” he says. Strikes have likewise been prominent in Canada’s southern neighbor over the last year. Teachers in West Virginia made national headlines when strikes across the state won higher wages from a Republican governor and legislature. Thousands of hotel workers went on strike later that fall, and teachers in Los Angeles began their first strike in 30 years on Jan. 14, among other labor actions recently conducted by teachers around the United States. “I think there does appear to be something new going on in the U.S.,” says Mr. Eidlin. He thinks there is a greater openness to ideas like socialism in U.S. life, but he says the critical component is mass mobilizations affiliated with more formal organizations (like unions or civic institutions) than decentralized movements like Occupy Wall Street. The teachers’ strike shut down schools across all 55 counties in West Virginia, for example, extracting concessions from the same legislature that tried to curb union strength by passing “right to work” legislation just two years earlier. 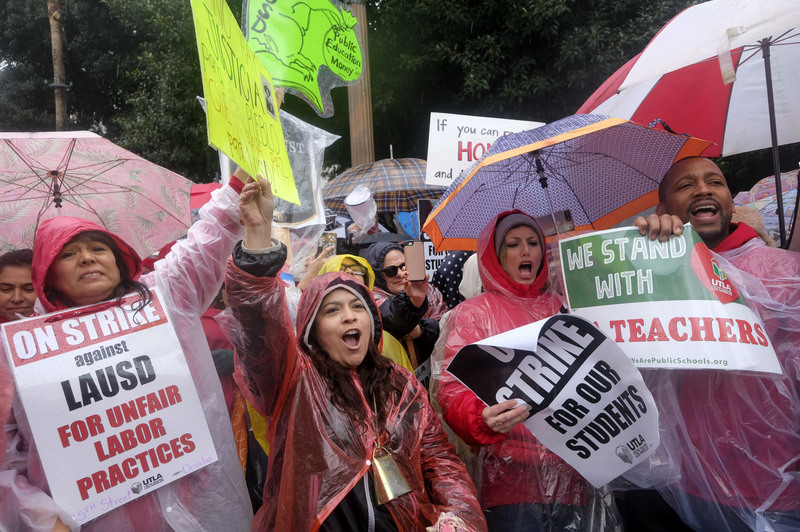 The teachers’ walkouts in the United States, whether initiated by unions or wildcat walkouts emerging from rank-and-file frustration, suggest a new labor militancy, according to Mr. Eidlin. In Canada, however, Mr. Eidlin says C.U.P.W.’s tenacity represents a continuity of labor relations. Contrary to the picture of a placid social democracy sometimes projected onto Canada, Mr. Eidlin says, the history of Canadian labor includes hard-won struggles that earned some Canadian unions a reputation for fierce advocacy. His narrative bucks the perception of union differences between Canada and the United States that relies on unreliable assumptions about cultural habits. “Popular opinion about unions is actually very similar in both countries,” says Mr. Eidlin. Public support for unions is often even slightly lower in Canada than in the United States. The real reason for the power of Canadian unions, he says, is union density—the amount of workers who are unionized. Union density is three times higher in Canada than in the United States, according to his research. Mr. Eidlin says there is a historical, rather than cultural, explanation. Though both countries had to contend with a radical labor movement in the early 20th century and during the Great Depression, the responses of the ruling parties in each nation were significantly different. That made labor one special interest group among many in the United States, where in Canada labor retained its position as the socially dug-in representative of the working class. “The paradox here is the more pro-union response ultimately lead to labor’s long-term weakness, [while] the more hostile labor response led to labor’s long-term strength.” Though these trends have defined labor relations in their respective countries for decades, Mr. Eidlin says there are signs that things are changing in both countries. The Supreme Court of Canada declared in 2015 that the Constitution protected the right to strike, complicating the state’s routine strategy of intervening in labor disputes legislatively (something that will be tested as C.U.P.W. pursues legal action). Mr. Eidlin says the wave of strikes across the United States and the popularization of socialism “shows at least parts of labor are finally starting to break out of that special-interest straitjacket, recognizing they have to act in a mass mobilized, class representative way” and not just as an addendum to the Democratic Party’s interests. As both countries get ready for federal elections—2019 in Canada, 2020 in the United States—candidates may have to contend with a newly awakened labor movement, recalling a legacy of hard-earned victories and refusing to be just one more interest group in the party establishment. The US Supreme Court's Janus decision of 2018, eliminated the forced union membership of public school teachers. The two large teacher unions, NEA and AFT, were ready for the fight with plans to walk out in every precinct that would get behind the effort. In Los Angeles where I live, the union did not bargain with the district. They made their demands and didn't budge until late Monday night. We still don't know the results of a tentative agreement. The union plan was to terrify teachers that their jobs wouldn't be there if they didn't picket their co-workers. The problem with public sector unions is that they have the money to put their sympathizers on school boards. Then, they get what they want, even pensions that bankrupt the schools. A union in a private industry isn't able to put their friends into decision making offices. Bottom line - it's not for the children, and it's not for the teachers, the union is for the union. The Labor Movement--whose very existence is central to Catholic social teaching--has been hammered in the past half century or more. Savvy anti-union firms, weak labor laws, neoliberalism, and labor's own reticent to keep the "movement" active and not calcify, have resulted in an unjust economy. I'm heartened by recent strikes but it will take sustained organizing. This is a common anti-union tactic, i.e., find that sliver of unionized workers who make a m.c. income and then claim that unions are unnecessary. You don't say anything about garment workers, hospitality workers, and those in factories and the home health care industry. Since they don't make a m.c. income I take it that you support labor unions for them? As for teachers, as union members they secured this m.c. income! And don't forget the workplace grievance procedures, due process, and some workplace democracy. Much of their advocacy--and that other other workers in unions such as nurses--focuses on students and communities (for nurses, patients and their families). The Canada and European example don't work well. In those countries there is a single-payer plan (no need to bargain over health care or fold it into the faux "total compensation" figure), as well as a host of social welfare measures that help to support a family.